This is a guest post from Little House in the Valley who blogs about tips for smaller living. Many of her topics include little house plans, becoming financially savvy, and learning to do more with less. Little House and I are involved in a larger personal finance blogger’s network called the Yakezie.com, a community of finance bloggers selflessly supporting others with the common goal of sharing our finance experience and knowledge. As part of that support, we frequently swap posts to help broaden our readership. Why budget? Many people live day-to-day without any sort of financial guidance. People have inaccurate balances of how much money they actually make (bring home) and many are unclear on how much they spend and on what. Yet, when two people meet, fall in love and become a couple, it's a good excuse to get serious about your finances. Income, expenses, banking and credit all come into play here. The expression, "Two heads are better than one," definitely applies in the case of budgeting. Instead of working in isolation, a couple working together towards the same financial goals can achieve much more. However, before you can set any financial goals, you need to know how much money you have to work with and how much in expenses or debt you need to pay off. Budgeting is the first step in becoming financially responsible and independent. The word "budget" sounds about as interesting as doing chores around the house. Nevertheless, budgeting is really quite simple; a budget reflects the money coming in and going out. You track your income and expenses for a period of time, then set realistic goals based on the information you've collected. As you track your money, use this as a starting point to discuss areas where you might be spending too much and common financial goals you'd like to work on. Now comes the dirty work; it's time to track income and expenses. Tracking income is the easier of the two, but make sure you've accounted for all income streams including any supplemental income, credits or extra cash. You'll also be pleasantly surprised that by combining both of your incomes, you have more money to work with before and after expenses. The harder part is the latter: Tracking Expenses. If you're combining households, some costs have gone down for one of you (or possibly both). Take this time to also discuss each other's bills, especially debts like credit cards, student loans and any other debt either of you have. 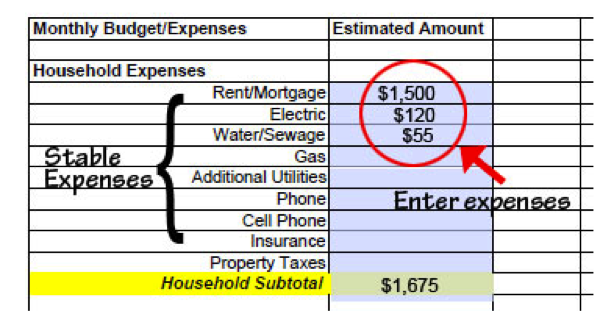 Now for the nitty-gritty: Calculating Expenses. There are a couple of ways to do this; one is manual, the other more automatic. The manual approach means collecting receipts or tracking every single expense, then entering it into an Excel spreadsheet or writing it by hand in a log of some kind. It can even be a simple legal pad which is definitely more tedious, but still effective. The automatic approach will still mean entering in all receipts, but doing so in a program like Quicken or Budget Pulse which will tally everything up for you as long as you've categorized your entries (groceries, eating out, insurance, etc.). Both programs, one is software the other a website, will create graphs and charts giving you a visual of where you spend your money. There are also free, online tools you can use to manage your finances. Quicken has a product called Mint that can do a variety of things along with educate you both further about your money. This is also a perfect time to discuss who will do the work. At this stage it is highly recommended that you both play an active part in the actual tracking and monitoring of your money. Married couples who manage their money together are typically more financially successful. For recurring expenses that don't fluctuate, set the amount to the realistic figures. 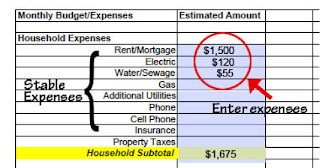 It's always a good rule of thumb to set your budget to reflect your actual expenses and for the sake of sanity, round up not down on the more variable ones. If your cell phone bill is always $68.90 a month then put $69.00 down in the budget. The first month or two, you'll want to follow your expenses and compare it to your budget; tweak the budget as needed. Hey, this sounds like a lot of work! For many people with reliable incomes and stable expenses, much of the work load is in the beginning in the form of tracking money coming in and going out. Once you get into the groove and hopefully continue tracking expenses, the budget can be reviewed only a couple times a year. The greatest benefit is that you and your partner will have a good understanding of your income and expenses. Together as a team you can set future financial goals and create a plan to achieve those goals. Those goals might include paying off debt, saving for a house, or building an emergency or slush fund. Now you have a starting point. I know people differ on this, but for us, we couldn't have achieved nearly the financial success we have if not for our commitment to budgeting and tracking expenses. A budget is or blueprint for success, and tracking expenses (and income!) tells us whether we're following the plans! Nice post! I agree that couples need to team up with each other to really succeed. I know many couples who prefer to keep their finances completely separate. You combine a saver with a spender and together the couple's finances go nowhere.